Okay, so you’re laughing and saying “boy, that Shirley really is on a cookie kick.” Well, not really … bear with me. 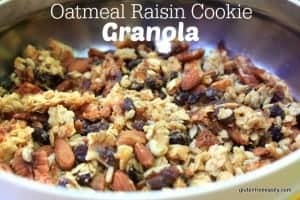 This Oatmeal Raisin Cookie Granola that I’m sharing today is a healthier treat that I first made for our camping trip a few weeks ago. It’s actually the result of a somewhat failed recipe, or accident if you will, but a very happy one. The results were so good in fact that I purposely made this recipe this past weekend for our weekend camping, with a few more tweaks to make the recipe healthier. The initial accident has turned into a favorite recipe—“new and improved” granola. Here’s what happened. After I made the Almond Peanut Butter Cookies that delightfully transformed to Cookie S’mores, I made a second batch of cookies—Mr. GFE’s favorite cookies, Flourless Oatmeal Raisin Cookies. I had just enough Gifts of Nature Rolled Oats left to make my Flourless Oatmeal Cookies and just added in some finely chopped raisins to the cookie dough. I chilled the dough while the other Almond Peanut Butter Cookies were baking. Then I dropped the cookies onto my parchment-lined cookie sheets as required and set my timer. Anyway, I thought, why not use the cookie pieces to make granola? So I broke all the cookies into small pieces and immediately stirred in several different nuts and seeds. Because the cookie pieces were still very warm and a bit gooey, some of the nuts and seeds clumped together a bit. 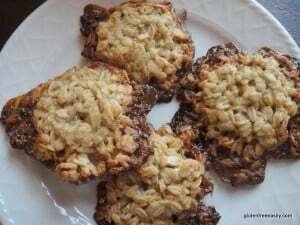 The naturally caramelized edges of the cookies added a very pleasant element to the granola. In fact, the taste and texture was just right for granola. Mr. GFE was not disappointed at all to be presented with Oatmeal Raisin Cookie Granola versus actual Oatmeal Raisin Cookies. We munched on this tasty granola on the way to our property, and when I popped open the lid of the tin later when our friends showed up, they couldn’t stop eating this granola either. I told them what had happened and they agreed it was the kind of accident that everyone should have. Honestly, I may never make granola another way. One only has to stir the ingredients together at the end of the process versus stirring every few minutes when baking all the granola ingredients in the oven. Plus, the nuts and seeds don’t really need baking with the oats. The sunflower seeds I used were already dry roasted, but even raw ones would probably taste just fine. Other dried fruit would also make a great addition. Now going to the trouble to make individual cookies to later break them up and add to granola does seem a like more trouble than necessary, but it’s worth it! I did try an easier, alternative method (see notes), but far prefer this version shown below. 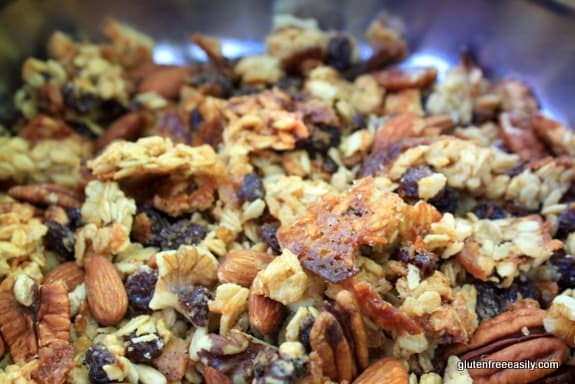 This granola is great for a camping trip, hike, or breakfast or snacking at home—enjoy! Make Flourless Oatmeal (Raisin) Cookies recipe as directed, but do not bake the full time. Remove from oven right before baking time is complete. You want the cookies to still be fairly pliable. Immediately stir in seeds and nuts. Store in airtight container like a cookie tin or very large glass jar with screw-on lid. I did try making this granola without making individual cookies to speed up the process a bit. Plus, I wanted to use quinoa flakes and make these dairy free by using coconut oil. So this past weekend, I used the Flourless Oatmeal Cookies recipe, substituting quinoa flakes for oats, substituting coconut oil for butter, and spreading the dough onto the parchment-lined baking sheet in a thin layer like one would for cookie bars. I took the bar cookies out of the oven before the baking time was completed and lifted all out with a spatula. Then I broke up the pieces and mixed in the nuts and seeds as I had with the Flourless Oatmeal (Raisin) Cookies before. This version was still good and more nutritious given the quinoa component, but with the cookie pieces not having been baked as individual cookies, there were very few caramelized edges and the cookies crumbled into fairly small pieces. This post is linked to Slightly Indulgent Tuesdays and Gluten-Free Wednesday. This one looks like it would be sooo delicious. I think if I make this one, by pumpkin vanilla granola will be taking a back burner. Hehe! Hey Kim–Oooh, that mistake sounds like a great one, too … especially this time of year! There’s probably room for both of our granola flavors. 🙂 I know I’ll be looking forward to that post and the recipe! I can’t remember any time that I’ve had a “failure” that didn’t turn into something else great, even if it was just a cookie crumb pie crust. 😉 Reinvention/repurposing is fun! genius… way to ‘save’ the cookies!! 😀 this looks SO good! Well, you’ve done it once again. Brilliant move and flourless no less! You really are the queen of flourless baking. I love the idea of saving the day by recycling your cookies. I’m a huge fan of granola (AKA trail mix, etc. ), so I’ll save this tip of yours for future mixes. I love bringing a big batch of granola when I travel. It makes for great snacks and wonderful breakfasts in hotel rooms (those “free” breakfast buffets are out of the question for people with gluten issues). I also pack a couple of small boxes of organic rice milk, then ask the kitchen for a bowl and spoon. It works great and I can have breakfast whenever my heart desires (4:30 AM, maybe). =) Love this post, Shirley. Peace, love and gluten-free granola! Hi Lexie–Yes, the word “cookie” translates to instant goodness, doesn’t it? I hope you and the kids enjoy it! First, this sounds so yummy. I love the idea of not cooking the nuts. I prefer raw. That whole good-nut-fats-go-rancid thing. But we also love granola. Especially in the winter time. Sounds awesome! I am a big fan of “chunky” granola, and this is the perfect opportunity to make it as chunky as I want! What a hppy accident. I love how you recovered from it and created a new family favorite. This sounds delicious – I can’t wait to give it a try! Hi Alea–Thanks! I’ve learned to think on my feet over the years. LOL So just about everything is salvageable or reinvented somehow when occasional “accidents” happen. Please let me know if you do try this granola out. I’ll look forward to your version! What a great idea, Shirley! I’m sure that granola is delicious and addictive. I’m thinking it would make a good snack for my 19 yo to take to school. Hi Debi–Don’t they say that failures are just another way of finding out a way you don’t want to do something? Edison had thousands of those, right? Accidents can sometimes be the best luck ever! 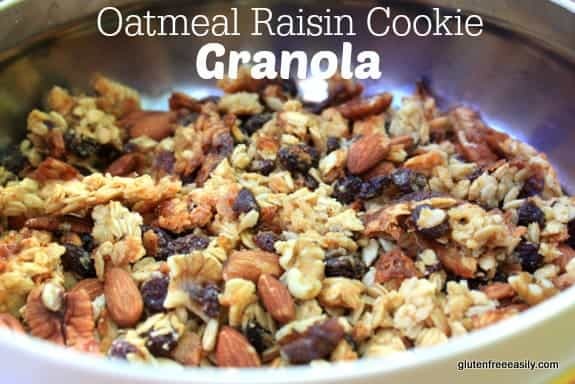 I love oatmeal cookies, epecially the chewy raisins…So good! I bet your friends didn’t mind you being late one bit with all the goodies you had in tow. Tummy bribes! What a good come out for an accident! The granola looks to die for,…really! Love recipes that happen out of kitchen accidents! Those are the best and can be absolute favorites!! I bet it smells heavenly!! I haven’t made granola in ages!! Shirley, this sounds entirely, totally and completely fantastic! And you know what they say–there are no mistakes in cooking, only new recipes! 😉 You have proven the adage with this phenomenal granola, which I now MUST TRY! I love happy accident recipes! This sounds awesome. I do love this granola!